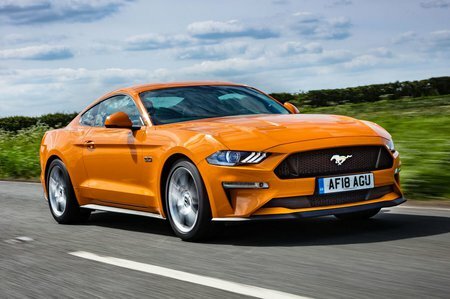 Ford Mustang 2.3 EcoBoost 2dr 2019 Review | What Car? What Car? will save you at least £545, but our approved dealers could save you even more. You get plenty of standard kit on the entry-level Mustang with the 2.3-litre engine. That includes a 12.0in digital instrument cluster, an 8.0in infotainment system with Apple CarPlay and Android Auto, keyless entry and start, six-way power adjustable front seats with lumbar support, adaptive cruise control, automatic emergency braking, lane-keeping assistance, auto lights and wipers, 19in wheels and a limited-slip differential. Even the entry-level engine gets a hefty 288bhp and loads of pulling power from around 1500rpm. Although the performance is pleasing, it’s still thirsty and emits an awful lot of CO2. The synthetically enhanced four-cylinder noise feels out of place in a muscle car, too.